OPTIMA's search for the ultimate Street Car is coming to a track near you! If you're looking for pure power, look no further. OPTIMA® batteries deliver the long-lasting, unsurpassed performance that today’s auto professionals and enthusiasts demand. Our unique SPIRALCELL TECHNOLOGY® and PUREFLOW TECHNOLOGY™ give OPTIMA batteries over 15 times more vibration resistance and increased cycle life compared to traditional batteries. And every OPTIMA battery is NON-SPILLABLE and maintenance-free for absolute peace of mind. So, no matter how extreme the conditions, OPTIMA batteries deliver the ultimate in power, performance and reliability. We manufacture our own batteries in a dedicated facility, where we meet our demanding OPTIMA Batteries standards and have completely revolutionized how batteries are designed and built. The 99.99% pure lead SPIRALCELL TECHNOLOGY® design of an OPTIMA battery provides winning power for hobbyists and professionals. Faster recharge and the ability to provide massive current on demand has made OPTIMA the right choice for performance upgrades and high-end audio systems. Looking for a marine battery? REDTOP is ideal for SUVs, hot rods, street cars and other applications that require a spill-proof starting battery. YELLOWTOP is the ideal battery for modern accessory-loaded vehicles. If you’ve ever gotten your wheels 8' off the ground, you know it takes a lot of power to make it happen. Whether you’re hopping on hydraulics or airborne in a trophy truck, YELLOWTOP is the ultimate dual-purpose power source. So you can handle everything from winching your 4x4 up the side of a cliff to blasting bone-rattling bass. Lifted or lowered, on road or off, gas or diesel, OPTIMA batteries have been out-powering and outselling the competition for more than 20 years. With impressive high-power delivery and extreme resistance to the most common causes of battery failure, the REDTOP is ideal for trucks. Trucks with winches, high-demand electronics and heavy equipment can rely on YELLOWTOP to provide ultimate starting and deep-cycle power. Those first few seconds during starting are critical. Fail there, and your dreams of racetrack superstardom will sputter to a stop. That’s why thousands of racing professionals, off-roaders, and hot-rodders all use REDTOP, the battery that’s custom-designed to deliver the power you need, right when you need it. More power per pound than a traditional battery, REDTOP also gives you a competitive edge on the track, where every ounce counts. Give it a shot, and who knows, you might even break a few records yourself. REDTOP is ideal for hot rods, street cars and other applications that require a spill-proof starting battery. With premium cranking power and impressive cycling capability, YELLOWTOP is perfect for modern accessory-loaded vehicles. 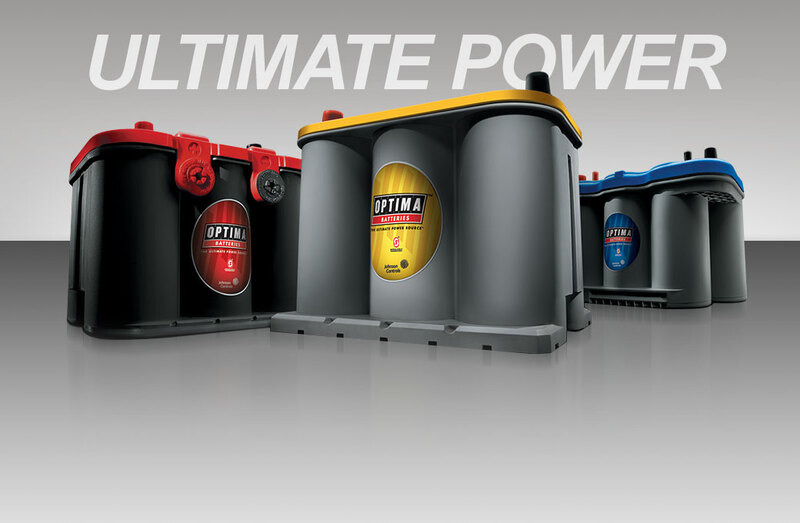 You can count on the power of OPTIMA starting and deep-cycle batteries. Specifically designed for marine use, an OPTIMA battery lasts longer and starts reliably, even after infrequent use or off-season storage. Plus, with OPTIMA batteries, you always get vibration resistance, sturdy zero maintenance and leak-free design with fast recharge acceptance. BLUETOP is the perfect marine battery for boats with trolling motors, extensive electronic systems, and works well as a battery for RVs with creature comforts that tend to drain batteries quickly. Pure and simple, the YELLOWTOP was made to get things done. On construction sites or long hauls across the country, YELLOWTOP is there to help you power through extreme temperatures, high accessory loads, deep discharges, short recharge cycles and extreme vibrations. All at once, if necessary. Commercial vehicles and heavy equipment can rely on YELLOWTOP to provide ultimate starting and deep-cycle power. Battle-proven and combat-ready, OPTIMA Batteries are approved and used by the U.S. military for a wide variety of military vehicles and equipment. OPTIMA Batteries deliver power in extreme situations; but it doesn't have to be a matter of life or death to choose OPTIMA. It could be a simple matter of dependability. For more information on our military batteries, please contact jim@milbatteries.com.